BANGKOK/SINGAPORE (Reuters) – Thailand is set to see the most funds raised from IPOs in Southeast Asia this year, with more than $5 billion expected to be garnered in the second half, sources said, as a tourist boost to the economy trumps jitters stoked by inconclusive elections. Southeast Asia’s second largest economy is expected to see listings from the retail arm of state-owned oil company PTT Pcl, the hospitality business of tycoon Charoen Sirivadhanabhakdi’s empire, and a unit of the country’s largest retailer Central Group, people familiar with the matter said. First-time share sales from these companies and others could make it the largest haul for the country in six years, said the sources, who were not authorized to speak to the media. Investors are focusing on the country’s stable economic growth and currency and do not see any big risk from political uncertainty. Preliminary election results show Pheu Thai, the leading anti-junta party, has won the most constituency seats, while the pro-army Palang Pracharat gained the most votes, but each is unable to form a government on its own. Low interest rates and a hunt for high-yielding assets are driving investors to allocate money for equities, fund managers said. “People are waiting and IPOs will sell,” said Narongchai Akrasanee, chairman of MFC Asset Management. Tourism is a strong pillar of Thailand’s growth, with the country expecting visitor arrivals to rise by 7.5 percent this year. Thailand’s finance minister said last week that the country will introduce economic measures worth about 20 billion baht ($624 million) to boost consumption, tourism and help low-income earners. Last year, Vietnam was the biggest market for IPOs in Southeast Asia, with listings there raising $3.4 billion, according to data from Refinitiv. Bankers say 2019 is set to be Thailand’s strongest year for IPOs since 2013, when they raised over $6 billion. In 2018, Thai listings raised $2.5 billion after mopping up $3.8 billion in the previous year, Refinitiv data showed. “One positive in Thailand is that domestic investor liquidity is extremely healthy,” said Ho Cheun Hon, Credit Suisse’s Singapore-based head of Southeast Asia equity capital markets. 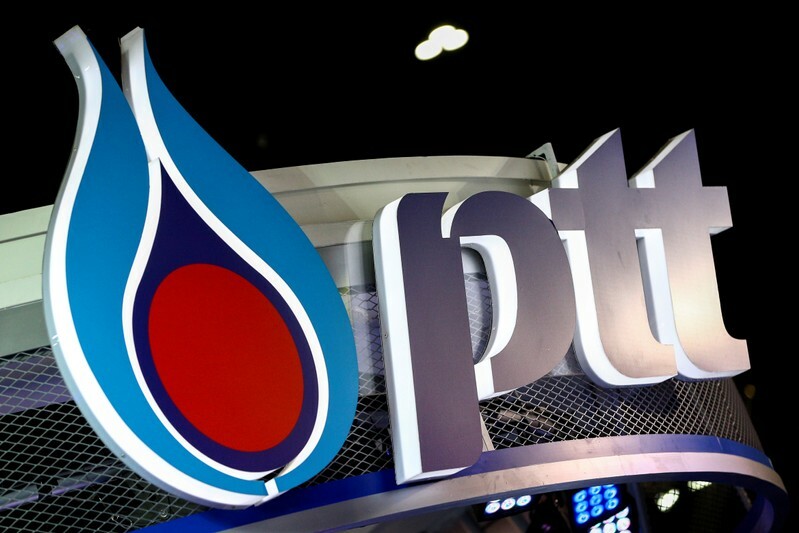 “Assuming the final election outcome does not impact consumer and investor sentiment negatively, we are hopeful that market conditions in the second half of the year will be constructive for the strong Thai pipeline to push through,” he said.PTT Oil & Retail, which includes gas stations, coffee shops and convenience stores, is expected to kick off its IPO process after the election results and could raise about $2 billion, sources said. Mall operator Central Group’s retail arm is also slated for a stock market flotation later this year and could raise $1 billion-$2 billion, sources said. Asset World Corp, the hospitality arm of TCC Group, which owns office buildings, luxury hotels and shopping arcades, plans to launch a $1 billion-$1.5 billion IPO in the second half of the year, IFR reported in January. PTT, TCC and Central did not respond to Reuters requests for comment. While there is short-term volatility in markets, Thailand’s benchmark index is trading at close to its five-year historical PE ratio, so IPO plans should go ahead if there is more clarity in politics in the second half of 2019, said Nunmanus Piamthipmanus, SCB Asset Management’s chief investment officer. Some investors, however, cautioned that issuers had to ensure IPOs were not overpriced. “Competition and supply in offices, hotels and malls make these sectors challenging,” says Thidasiri Srisamith, chief investment officer at Kasikorn Asset Management. America has to fix the attack by Russia on the 2016 election, but it’s a “false choice” to conclude impeachment is the only solution, according to Hillary Clinton. Maryland Gov. Larry Hogan said Tuesday he is considering a Republican primary challenge against President Donald Trump for next year’s presidential election. Hogan spoke at a “Politics & Eggs” event in New Hampshire and confirmed a White House run could be in his near future. The governor added that seeing the Republican Party throw its full weight behind Trump for the 2020 election indicates a shift in how the party used to be. “Just because aides did not follow his orders, it’s the only reason we don’t have obstruction of justice,” Hogan said. Hogan has been critical of Trump in the past. He told the media in March it is not the “enemy of the people,” a phrase often used by Trump. Earlier in March, he teased a potential White House run but said he would need to see “an actual path to victory” before joining the race. Americans are punishing President Donald Trump at the polls, and his best hope might come if Democrats try to impeach him, MSNBC “Morning Joe” host Joe Scarborough said Tuesday. “Donald Trump’s best hope for higher poll numbers, and for re-election, is for the Democrats to try to remove him from office through impeachment,” Scarborough said on his program while discussing the results of a Morning Consult/Politico poll released Monday. According to the poll, Trump’s job approval rating has dropped to 39%, tying the low numbers he posted after his reaction to the violence in Charlottesville, Virginia, in August 2017. The poll also showed that 57% disapprove of Trump himself. Meanwhile, impeachment gave President Bill Clinton a “very nice departing gift,” Scarborough said. “I’m talking as far as politics go and being part of a house of representatives back in the 1990s who impeached Bill Clinton when he couldn’t get prosecuted in the Senate, and it ended up we gave him a very nice departing gift and that is a 60% approval rating,” he added. “Americans are reflexively against impeachment . . . whether that’s right, whether that’s wrong, if your ultimate goal is removing Donald Trump from office, then impeachment politically is the worst way to go,” Scarborough said. MADRID (Reuters) – The main contenders in Spain’s national election prepared for a second televised debate on Tuesday after a encounter in which they accused each other of lying but left open questions about what coalition deals might eventually be struck. Sunday’s election, one of the most polarised since Spain’s return to democracy four decades ago, is being fought on emotive issues including gender equality and national unity following Catalonia’s failed 2017 independence bid rather than matters such as the economy and climate change. With the result too close to call, the focus on heart rather than head makes it unlikely that candidates will broach new topics in Tuesday’s second round. Ignacio Jurado, politics lecturer at the University of York, suggested rightists Pablo Casado of the People’s Party (PP) and Albert Rivera of Ciudadanos might change roles after Monday’s two-pronged attack on Socialist Prime Minister and election frontrunner Pedro Sanchez. Casado might become more aggressive and Rivera pull his punches, Jurado said. The right-leaning El Mundo newspaper suggested Casado and Rivera had outflanked Sanchez over Catalonia – an issue that has dominated national politics in the last few years. Sanchez, who took power in 2018 after a series of corruption scandals led to the PP’s downfall, has been more open to dialogue with Catalan separatists than other parties and he may need their support to form a viable government. 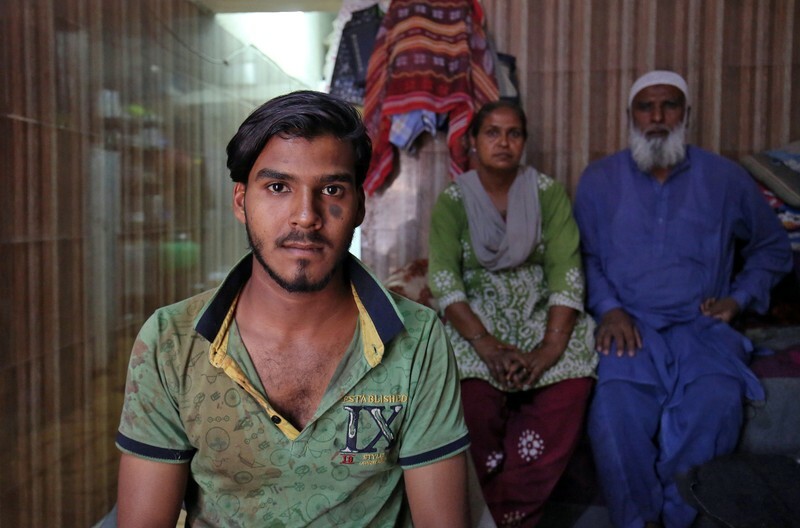 But he has repeatedly insisted that independence is not up for discussion. Left-leaning El Pais said Sanchez, seen as a less inspiring public speaker than Rivera and Casado, had not lost the debate. “Sanchez achieved the minimum required. He managed to get his message across but demonstrated little flexibility,” said Jose Fernandez-Albertos, a political scientist at Spanish National Research Council CSIC. Madrid residents who spoke to Reuters TV on Tuesday morning said the leaders should focus more on creating jobs and improving social benefits than clashing over patriotism. “Catalonia, the flags, Spain – those things don’t shock me. I care about work, well-being, my relatives and society in general, specially the most defenseless,” said one, who gave his name as Jose Antonio. University of York’s Jurado said candidates may try to present themselves in different ways on Tuesday but the issues were likely to be the same. Should Sanchez’s poll standing be harmed by the debates, the election outcome risks becoming more murky than ever. A putative coalition of Casado’s PP, Rivera’s center-right Ciudadanos and the far-right Vox of Santiago Abascal, meanwhile scored a combined 45 percent – putting them short of a parliamentary majority. Polls show up to four in 10 voters have yet to decide who to cast their ballot for. Arguably the greatest unknown remains Vox, tipped to win about 30 seats on Sunday in the 350-seat legislature but prevented from participating in either debate because it currently has no parliamentary representation. 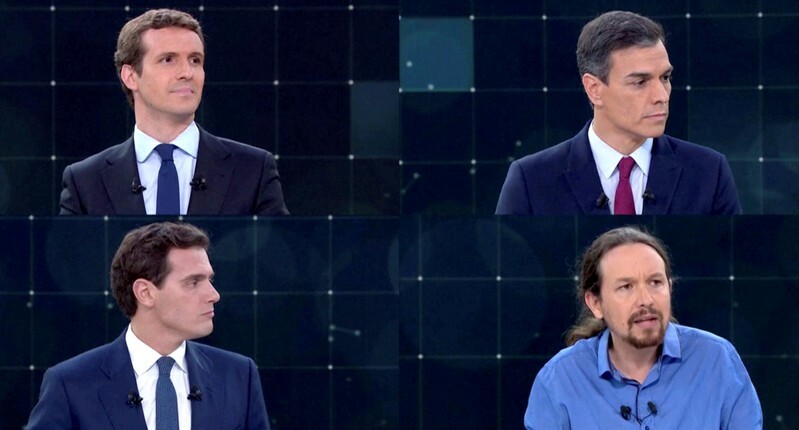 In comments during Monday’s debate, Abascal criticized the lack of media coverage for his party and the lack of diversity between his main rivals. Vox would bring “order and freedom” to Catalonia, he said.